United Inflatable rides has party rental units for all ages, even the smallest guests. Toddler Bounce House Rentals have safety features built-in to keep small players safe while still having as much fun as any larger jump house. 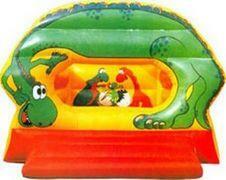 These inflatables will keep your little-ones entertained for hours! 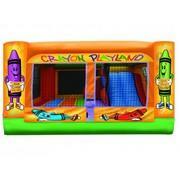 Browse the selection of toddler bounce houses below and click on the title or image for more information and a larger picture. Also note that you can add a second day of bounce house fun for half the price with any first day rental while supplies last! While these moonwalks are great for the toddlers, check out our Combo Bouncers page if you're needing a larger inflatable to complete your party! 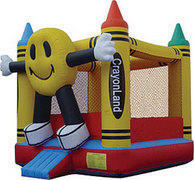 Prices include delivery, setup, and take down of each Toddler Bounce House Rental. Fees for sites thirty miles outside Irwin exist. Rental time excludes setup, as we arrive 1-3 hours early, because our clients deserve the full rental time. We'll call to confirm a delivery window the day before your event. For extra info about our delivery area, please read more. United Inflatable Rides is rated top notch in customer service with the best variety of toddler bounce houses, inflatable slides or anything you could possibly need to complete your party rental! We've trained our entire crew to work efficiently so set-up of your jump house is quick and easy. Our business stands out for our efforts to work safely and maximize customer service, which is why we are fully insured in the Pittsburgh area. You can also trust that your bounce house rental is always clean, because we sanitize after every rental. United Inflatable Rides has been in the business for years, and we are proud to continue to serve you! United Inflatable Rides rents Toddler Bounce Houses, Snow Cone & Cotton Candy Machines, Bounce Houses, Combos, and Obstacle Courses for your party needs in the Pittsburgh area. Give us a call at 412-453-5050 (or 412-427-6895) or Click here to get a bounce house quote online.